Regal Cinemas hosted midnight screenings of Syfy’s “Sharknado” on Friday night. A lot of new watchers, along with “Sharknado” fans came out to attend the special screening. We ran into a live shark, and an Asylum employee! A red carpet was held before the movie showing that included stars of the film, Ian Ziering (Fin) who played the hero desperately keeping his children and ex-wife safe, as well as rescuing a bus full of children; Tara Reid (April) who plays Ziering’s ex-wife; Cassie Scerbo (Nova) who played an employee at Ziering’s bar with a major crush on him; and Christopher Wolfe who plays Tara’s new beau, Colin. Audiences gave us their opinions on their favorite scenes in the film and who’d they would cast for “Sharknado 2”. Viewers seemed to love the scenes that involved chain-sawing sharks. More specific, star Ian Ziering chain-sawing the shark in half. Another movie goer thought that when Nova came out of the shark alive was the seller of the movie. Another fan loved the sense of scale and the attention to detail. 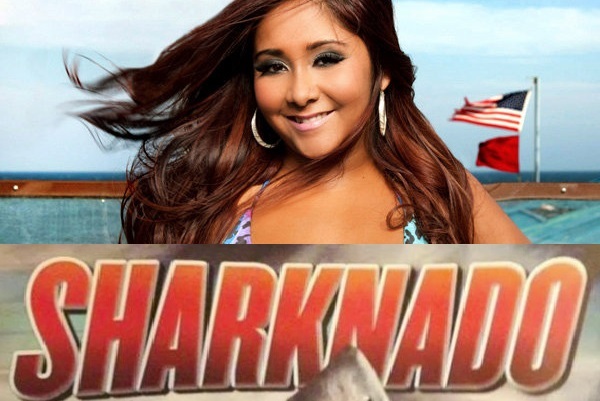 Who to cast in “Sharknado 2”? Fans named Chris Evans, Matthew McConaughey, Lindsay Lohan, and reality stars Snooki, and Gordan Ramsay. The Director of Post Production of Sharknado, is The Asylum’s David Courtice whom we caught up with after the movie. We asked him about the workings of social media on the popularity of the film and why people responded in such a big way. He said, “I think people can relate to this movie because they can let their imaginations run with it and it’s something that they could make themselves if they had the resources to do so.” Courtice said because it’s not a big “Hollywood” big studio movie, people were more receptive to it going in and embraced it, then went to Twitter and social media. “There are three major executives that are tied to this project and they’re in it because they want to make an enjoyable movie,” said Courtice.